In March, 2010, Time Flies received a mention in the “Opera Prima” category of the prestigious BolognaRagazzi Awards at the Bologna Children’s Book Fair in Italy. 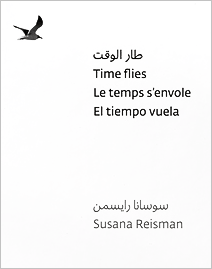 What the Jury Said: In Susana Reisman’s world, lines vibrate, triangles sing and numbers recall metaphysical clocks counting out the hours of eternity. Echoing Klee, Matisse and other 20th century artists, the artist aims to mesh music and painting. The result is so convincing that the pages seem to come alive. The tone, however, is always light-hearted, the medley of references and citations is always a source for enjoyment. The meticulous style provides an elegant framework for this delightful composition. Pictured: Author Susana Reisman (right) and publisher Nadine Touma (left) receive their award at the Bologna Children's Book Fair. In December 2009, Time Flies won in the “New Publications” category at the CJ Picture Book Festival is Seoul, Korea. Festival Review: A silent book with no words, using photographs of the hands and numbers of different watches to create a world where time stands still, to reconstruct another time, another place, and another perception of what is around us and what we take for granted. As time flies, this book invites us to fly with time and look at things not as we think they are but as we construct them to be, allowing every reader to interpret and tell the story as they see and would write. Every reader becomes a composer of images and a writer of signs. Purchase my book through PayPal. The price (CAD) includes shipping and handling.